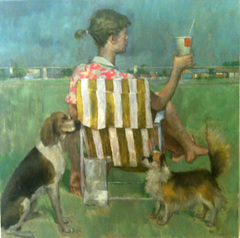 For a show of summer landscapes, Morgan Taylor's recent exhibit in the Art Lab Galleries, is not without controversy. Mostly, controversy about the light of the work. Let me start off by saying this is a beautifully crafted group of paintings. Taylor's work is showing artistic maturity. His years of tightly organized still life and landscape have developed a looseness that comes with time spent paying attention. He is able to almost scribble in details and areas which were once painstakingly painted. This gives the work a freshness and directness and a sense of mastery. A number of the paintings were painted while he was teaching in the Art Labs Summer Painting program, a program in which Mr. Taylor plays an important part. Aside from valuable comments to his students on their work, Taylor also teaches by example, demonstrating technique, showing the way. So some of these paintings on view are teaching (or pedagogical) paintings while other work represents Taylor's ongoing investigations, such as paintings of a woman on the beach, or other subjects that he chooses. In many of them the theme of light is a major player. 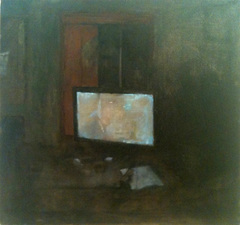 One painting is of an office eerily lit by the screen of a computer. Taylor is painting light,light in interior spaces,light beneath the canopy of trees on a stately lawn. And there is a light of a darkly lit outdoor scenes -- the darkness? a dense cloud cover? One is left to figure this out for oneself. It adds to the mystery of the work. Most of the people I spoke with had their own idea of what Taylor was doing. One woman told me the darker paintings were painted while the artist was wearing sunglasses. No matter what you thought, the light in the work had a strong effect. 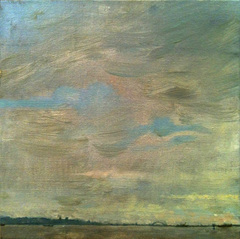 The "teaching" paintings were done in natural (available) light, mostly on the grounds of Snug Harbor. Snug Harbor, for those of you unfamiliar with it, is a beautiful Victorian estate on the north shore of Staten Island. It was built as a retirement home for merchant seamen 150 years ago and remained as such until about 50 years ago, when the remaining few retired seamen were relocated. The grounds were preserved and now is home to a botanical garden which includes a replica Chinese scholar's garden, a Children's Museum, other galleries and studios, performance spaces and the Art Lab, an independent art school with a staff of teaching artists. It is a wonderful setting, with neo-classical architecture set in a Victorian design. The grounds are resplendent with stately trees and formal gardens dotted with pools, ponds, and the occasional sculpture. One could not ask for a more picturesque setting in which a painting school could take place. 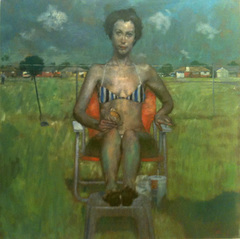 A number of Taylor's paintings are of students painting, or models posing on the lawn and in the studio. Throughout the exhibit there are paintings of people posing beneath magnificent large trees. 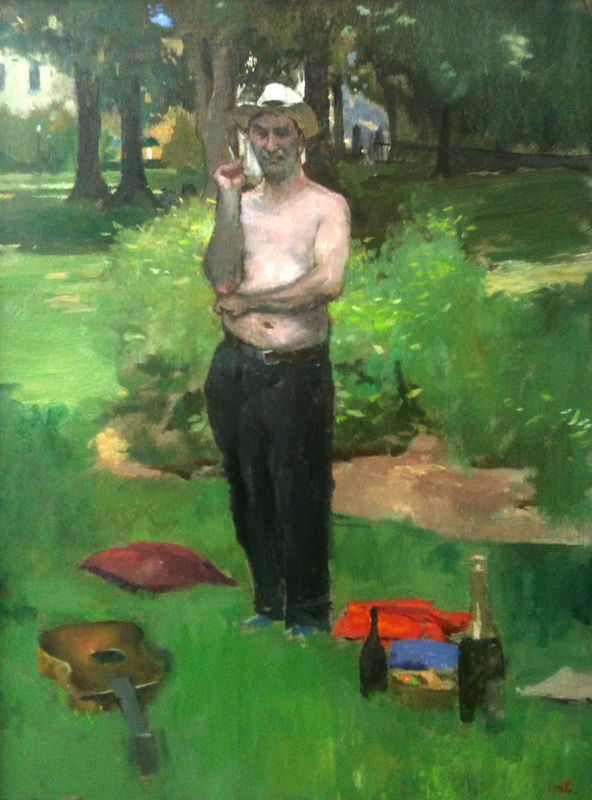 In 'French Guy at Snug Harbor (Christophe)' (see above), a shirtless man stands on a lawn. The man and all his attendant objects sink nicely into the painting, it is no small accomplishment to have the objects of a painting seem to be weighted and strongly connected to the ground The grassy lawn is laid in with horizontal smoothness. Taylor's use of color creates an excellent light in the work. This seems to be his strength, color creating light wed with excellent drawing skills. The centerpiece of the show is a triptych, 'Home', consisting of three 42" squares. Each painting has a figure in it. The figures are ordinary people. They are seen in an outdoor space. A woman in a bikini sits in an aluminum tube lawn chair; she gazes out into semidarkness. The light on her figure is a blue-green. 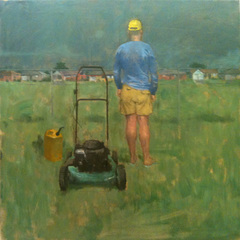 Another square has a man, hands in his pockets, seen from behind, he is standing next to a power mower. The third is another woman in a beach chair, a towel draped over the the chair. Two dogs are in the front of this painting. There is a darkness within each of these canvases. A vacant mood is felt. Each figure seems isolated. They all seem to be inhabiting the same dark world. Taylor has created a mood construct, using color, light and character study, this triptych is a study of modern zeitgeist. an essay of twenty first century contemporary life.